I have finally hit rock bottom on the running front. The chest infection i had resulting in some heavy coughing, which in turn has pulled several muscles in my stomach and back, consequently i cannot run at all now. Hopefully i will finally be able to do some light training next week, and with the Henley ½ only 6 weeks away will have revise my target time. Initially this was to be about 1:24, but i will have to aim for 1:30ish instead. Good job the Kent 30 mile was cancelled, as that would have been a no-go and a waste of a trip. Have ordered a pair of Inov8 Roclite 315's to train in as these may be the footwear of choice for the MdS, so i thought i would see what they were like. 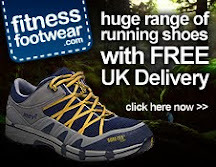 http://www.sportsshoes.com. Hi, hope you're feeling better soon. It's frustrating when illness cuts into the training schedule!